Enterprise Equity | Movidius raises $40 million in funding to accelerate adoption of visual sensing in the 'Internet of Things' "IOT"
Tuesday, April 14, 2015; Dublin, Ireland: Movidius, the leading vision processor company serving the growing need for visual sensing in connected devices, has today announced that it has raised $40 million in funding with the creation of up to 100 jobs in Ireland. This latest round of funding for the Irish-founded company was welcomed today by the Taoiseach, Mr Enda Kenny, TD and the Minister for Jobs, Enterprise & Innovation, Richard Bruton TD, at Movidius’ D’Olier Street, Dublin. 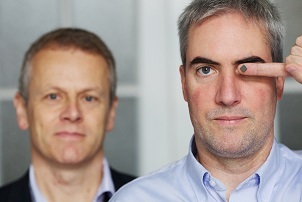 It is one of the largest VC investments ever in Ireland for a technology company and the largest for a fabless semiconductor company in the past two years globally. The investment was led by Summit Bridge Capital, the China-Ireland Growth Technology Fund co-managed by Atlantic Bridge Capital and WestSummit Capital, and includes new contributions from ARCH Venture Partners and Sunny Optical Technology Group, as well as early investors including Atlantic Bridge Capital, DFJ Esprit, Robert Bosch Venture Capital, AIB Seed Capital Fund and Capital-E. As part of this new round, David Lam of WestSummit Capital will be joining Movidius’ board of directors. Movidius will use the financing to further drive software and hardware product innovation in visual sensing for the next wave of emerging applications, including virtual reality headsets, drones, home automation and wearables. Its technology will transform how devices and users interact with the world around them through intelligent, vision-based technology. The growth of the Internet of Things, with billions of connected devices to be installed globally in the next several years, is accelerating the market for Movidius’ technology. This financing will enable Movidius to continue to work with its partners to fuel innovation and business growth in visually intelligent devices. In the last two years, Movidius has established offices in Silicon Valley, continued to scale its R&D team, appointed new members to its Technical Advisory Board, collaborated with new customers and partners, such as Google for its Project Tango device, and launched the next generation of its vision processor for mobile and connected devices. Minister for Jobs, Enterprise and Innovation, Richard Bruton, TD said: “At the heart of our Action Plan for Jobs is creating a powerful engine of Irish enterprise alonside the strong multinational sector we have built up. Today’s announcement that Movidius, a ground-breaking company operating at the cutting edge of global technology, is expanding in Ireland and creating up to 100 extra jobs here is a great example of what Irish companies can achieve. I wish Remi and his team every success with this project”. “Over the past few years Movidius has built a world-class team and delivered a technology and product that is truly unique, with capabilities that will have a major impact on the future of vision processing across a wide range of industries. We are delighted to lead this financing alongside an exceptional group of global investors.” – David Lam, Managing Director, WestSummit Capital. “Movidius is a groundbreaking company at a global level and this investment reflects that. It is a vote of confidence in the team, in the technology and the future of the company. It will facilitate a significant scaling up of activity at Movidius and not just take the company to a new level but Ireland’s reputation as one of the world leaders in computer vision technology.” – Brian Long General Partner, Atlantic Bridge Capital. “ARCH Venture Partners’ focus is on searching the globe for world-class technology pioneers with differentiated innovations capable of impacting multiple large markets. Movidius’ unique mix of novel invention and hard-charging, market-driven entrepreneurs position the company well to achieve leadership in a very important set of emerging applications.” – Paul Thurk, Managing Director, ARCH Venture Partners. “Movidius’ platform is at the forefront of vision processing, and is revolutionizing the way that consumers can view the world around them. Movidius has a passionate and proven executive team, a compelling family of products and a huge market opportunity. We are thrilled to join the company as it continues to drive change and growth.” – Yang Sun, CEO, Sunny Optical Technology Group. Movidius is a vision processor company serving the growing need for visual sensing in connected devices, providing a highly innovative vision processing unit (VPU) with a robust and powerful software development kit (SDK) environment. Movidius’ architecture delivers a new wave of intelligent and contextually aware experiences for users in mobile, wearable and other connected applications and devices. With offices in Silicon Valley, Ireland and Romania, Movidius is a venture-backed company with investors including Summit Bridge Capital, ARCH Venture Partners, Sunny Optical Technology Group, Atlantic Bridge Capital, AIB Seed Capital Fund, Capital-E, DFJ Esprit and Robert Bosch Venture Capital.